A case of style over substance? With the digital compact market as saturated as it is, it can be tempting to dismiss whole ranges (and occasionally even entire brands) as too cheap or under-specified to be worth considering. Sony's T-series cameras have always been slick and stylish, but only recently have they started to offer features - such as high sensitivity and optical stabilisation - that broaden their appeal beyond a point-and-shoot audience. 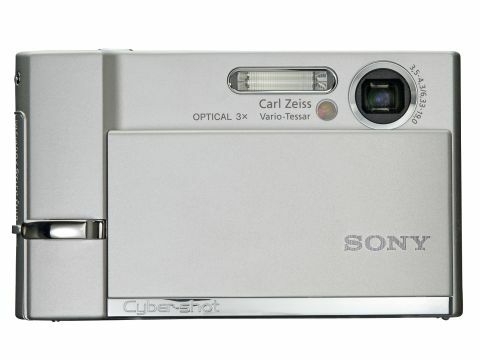 With its huge slide-down lens cover and corner-mounted lens, the T30 is instantly identifiable as a Sony. Build quality is uniformly excellent, from an all-metal case and huge 3-inch screen right down to chromed metal buttons. The T30 is plumper and heavier than its predecessor, the T9, but it can still slip into a pocket. The Cyber-shot powers up in around a second and uses a single menu bar that couldn't be easier or faster to navigate. Some of that speed fades away though with the Carl Zeiss lens, which putters rather than zooms through its modest 3x range. Other controls are precise but on the small side, especially the four-way menu pad. A sheet of polycarbonate covers the entire rear of the T30. That's great for design (and for protecting the LCD) but it attracts smears and fingerprints like you wouldn't believe. The screen itself gains half an inch on the T9's display but has no more pixels. It's sharp enough for framing and playback, and you can boost the screen's brightness easily without trawling through menus, by holding down the display button. But it's really dim conditions that the T30 has been designed for. The first line of defence is Sony's Super SteadyShot optical stabiliser, which does a fine job of banishing blur (if still not quite up to the ultimate stability of Panasonic's OIS system). Next up is improved sensitivity, which reaches a healthy ISO 1000 while keeping both colour and luminance noise tightly under control. You do sacrifice contrast and tonal vitality, though, so beware when shooting low-light portraits, which can emerge rather ashen. The built-in flash is also worth a mention, as it pumps out a surprisingly quantity of light for such a slim unit, serving up rich, natural colours. Despite lacking manual exposure, there's a good range of other creative features on board. Focusing is especially well served, with multi and spot modes, plus presets for grabbing snaps in tricky conditions. The autofocus system isn't the fastest we've used but it rarely makes mistakes - and can focus as close as 1cm in Magnifying Glass mode (just hit the Macro button twice). Colour, sharpness and contrast are easily tweaked, too. Drive modes include exposure bracketing and an average 1fps burst mode. Sony is always good on the power side, and the T30 has its usual smart battery that lets you know how much time you have left, rather than the less helpful 'number of shots' display on rival cameras. You should expect over three hours of operation from a single charge. It's amazing how much information the T30 extracts from its tiny corner-mounted zoom. The 7-megapixel chip hoovers up sharp edges and fine detail, matching it with crisp, natural colours and spot-on metering. There's a hint of softness and some light distortion at the edges but little enough to complain about. You can use the Super SteadyShot stabiliser on the bold, smooth movies, too, but most footage shot on digital cameras is so wobbly that it's difficult to see any real benefit..